With Christmas fast approaching, we have on offer a doooozzzy! 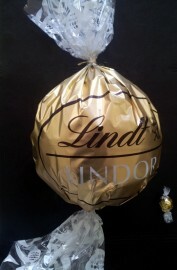 A rarely available White Lindt Lindor in gold foil wrap. The ball dimension is approx 23cm in diameter and with the foil top to end, length is approx 60cm. The weight is approximately 1.29kg. SECRET - The ball itself is a clear plastic mould containing 1 kilo of mixed Lindt balls like shown above. Unfortunately, it is not 1 giant white Lindt Lindor ball! ingredients: Sugar, Vegetable Fats, Cocoa Butter, Cocoa Mass, Whole Milk Powder, Skim Milk Powder, Milk Fat, Lactose, Emulsifiers (Soya Lecithin), Barley Milk Extract, Flavourings, Vanilla. Milk Chocolate contains Cocoa Solids 31% minimum, Milk Solids 20% minimum. Dark Chocolate contains Cocoa Solids 45% min. White Chocolate contains Cocoa Solids 31% min. May contain traces of tree nuts.